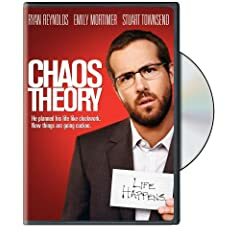 Chaos Theory – the latest poorly received Ryan Reynolds vehicle,Â is the tale of a man with a meticulously planned life (Reynolds) who encounters a series of mishaps when his wife sets his clock back ten minutes. It’s the standard “loosen up a bit” message, and critics weren’t particularly fond of it. Four months after the film’s theatrical release, Lakeshore Records is releasing the film’sÂ soundtrack, which isn’t exactly thrilling, but it’s a bit more exciting than the film itself. From the start, it’s an unfortunate choiceÂ that the soundtrack opens with seven actual songs (four provided by the indie rockers The Damnwells)Â before diving into Gilad Benamram’s occasionally impressive score work. The first seven tracks aren’t bad, they’re just not especially memorable. The Boy Least Likely To’s “Be Gentle With Me” is the best of the bunch and even it isn’t the kind of track you run out to purchase after a listen. The Damnwell’s have a kind of indie charm, but there’s nothing in their four songs (“Golden Days”, “Say”, “Graceless” and “Tonight & Forever”) that strikes a particularly original chord, thoughÂ “Tonight & Forever” is a well-written little ditty. The next 16 tracks are score music provided by Israeli composer Gilad Benamram, a relative newcomer to the film score scene. The 30-something composer shows an obvious knack for fast-paced, exciting music but doesn’t quite organize all his work behind a centralized theme. At times the horns can overpower some of the other music and overall the score feels just a little too jumpy, a bit likeÂ a Blue Man Group instrumental with a more dramatic flair. The truncated length of the tracks (averaging about a minute and a half apiece) doesn’t help establish a followable theme or pace to the album as a whole. But there are still moments of impressive intrigue, if you can get past the Blue Man Group meets Lalo Schifrin vibes. There’s a surprisingly spy-movie-esque quality to most of the songs that are fun but a bit out of place.Â The silences are oftenÂ every bit as important as the notes themselves in the methodically-paced score, particularly in the thrilling trackÂ “Shoot Something Tonight.” Overall, the soundtrack forÂ Chaos Theory is a nice mix of music for a good Ipod shuffle, but not something you’d sit down and listen to as a collective whole. No user commented in " CD Review: Chaos Theory Original Motion Picture Soundtrack, by Gilad Benamram "